64 I WRAPS I 2015 W hen Carl Brewer started wrapping cars nine years ago he had no idea he would become the go-to wrap installer to the stars. 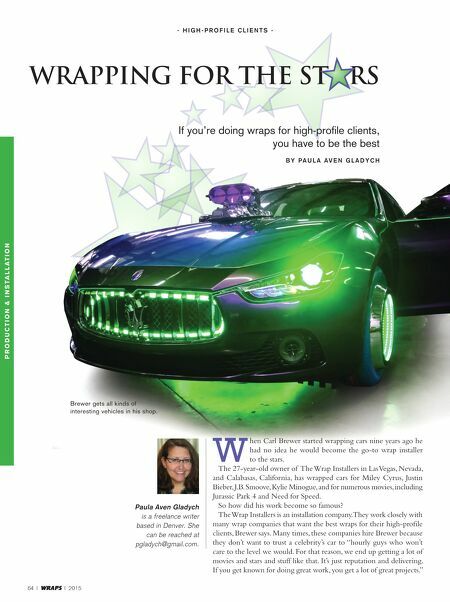 The 27-year-old owner of The Wrap Installers in Las Vegas, Nevada, and Calabasas, California, has wrapped cars for Miley Cyrus, Justin Bieber, J.B. Smoove, Kylie Minogue, and for numerous movies, including Jurassic Park 4 and Need for Speed. So how did his work become so famous? The Wrap Installers is an installation company. 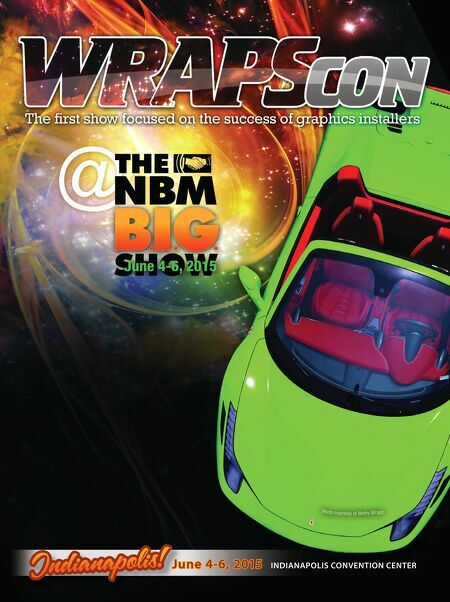 They work closely with many wrap companies that want the best wraps for their high-profile clients, Brewer says. Many times, these companies hire Brewer because they don't want to trust a celebrity's car to "hourly guys who won't care to the level we would. For that reason, we end up getting a lot of movies and stars and stuff like that. It's just reputation and delivering. If you get known for doing great work, you get a lot of great projects." Paula Aven Gladych is a freelance writer based in Denver. She can be reached at pgladych@gmail.com. p r o d u c t i o n & i n s ta l l at i o n - H i G H - P r o f i l e C l i e n t s - Wrapping for the St rS If you're doing wraps for high-profile clients, you have to be the best B y P A u l A A v e n G l A d y C H Brewer gets all kinds of interesting vehicles in his shop.